Gedanken über Technik, Sport, Gefahrenabwehr und was einem sonst noch so vor das Hirn fliegt. 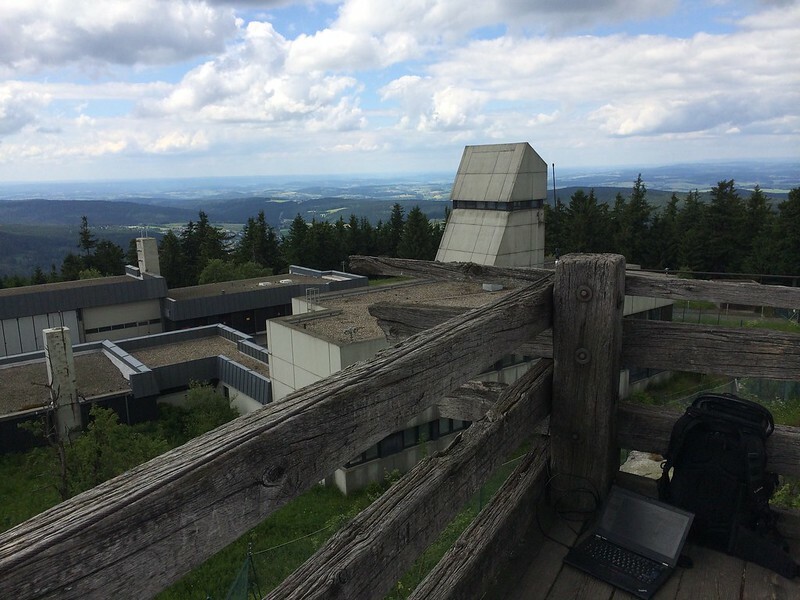 Why should you go outside with your RTLSDR? There are some really good reasons, why using the dongle in the field is a great pleasure! Many of us don't have the best situation for receiving, living in little flats not really high over the ground and without the capabilities of using real antennas like the big yagis. By climbing on little mountains, you can improve this situation a lot. Just test it and compare the spectrum of your SDR with the one at home and you'll see, what I mean. Especially in the VHF and UHF band, the effect is great! On these frequencies, the electromagnetic waves behave like light, if you can (virtually) see a transmitter, then you should be able to receive it. That's why getting up from the ground is so important and people are building huge towers in their garden. The other point is, you get away from many unwanted emissions, caused by modern electronics. That's a really big problem the shortwave guys have, but on the higher bands it's a problem, too. By the way, going outdoors is always a good idea, especially when you climb on hills! You don't that much for using the RTLSDR (or any other SDR you use) portable. I would bet, you already have the most of the useful things, but maybe I can give you some additional hints for making it more fun. Of course, you need a RTLSDR dongle and a notebook. Using the dongles with an Android tablet is possible, but it feels to limited for me. Maybe the new Windows tablets are the way to go, but since I don't own one of these, I couldn't write anything about it. @LondonShortwave on twitter shows photos from time to time showing his portable gear, so be sure to follow him to get instant updates! Of course, a light and small notebook is the way to go, because you have to carry it the whole trip. But even if it's not one of the fancy new ultrabooks, you can use it although. I'm using a Lenovo T420 and it's not one of the biggest ones, but you can't compare it a nice ultrabook or one of the subnotebooks on the market. What's really important, you need a very bright screen, especially when it's a glare one. I have to use my display on the brightest setting most of the day when I'm outside. And of course, even in this battery draining state, it should work long enough for our purposes. 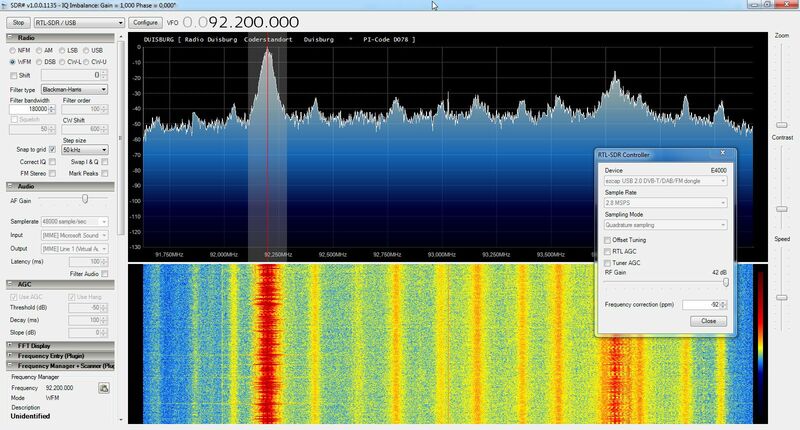 Remember, using SDR software like SDR# and SDR-Radio is quite challenging for the CPU! Of course, there are additional batteries and even solar panels that can extend the runtime of your notebook a lot, but it depends on your intentions, if they are really necessary. 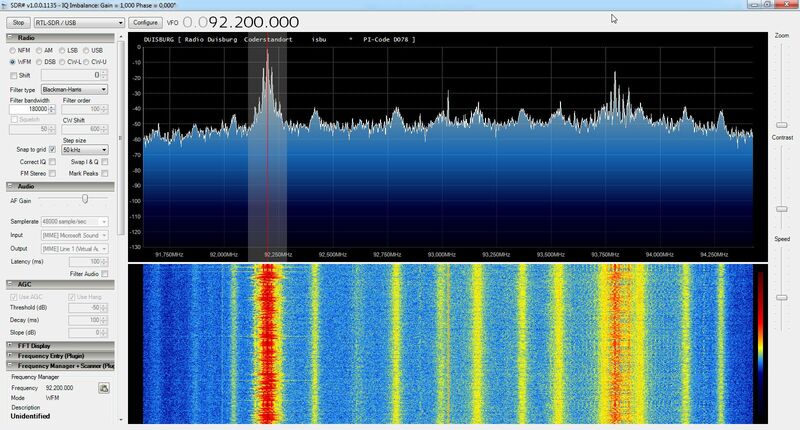 In an hour of receiving with a SDR, you can record enough stuff to work with it for many days. That's really a great feature to mention here, using the record function of your SDR software is so much fun. You can just record all the signals and analyze them at home, where it's warm, dry and you have connected your notebook to the powerline. But remember, it's quite a lot of data, recording the whole spectrum of a RTLSDR, or even an HackRF! Today, SSD's seem to be usual in notebooks and they are the way to go in a portable receiving machine, since they are fast and don't care about any mechanical influences wile receiving signals in the field. I'm using a SSD as the main drive in my Lenovo and a HDD in the Ultrabay instead of a CD-ROM, so I have the speed of the SSD and the space of a HDD in one portable pack. It makes no difference from using your dongle inside your house or outdoors, so there's nothing special to mention here. It's a known rule, that a good antenna is the best amplifier you can use. There is nothing special when you operate your dongle portable. I'm using a Diamond RH77 that's build for using it on a handheld transceiver. When using one of those antennas on a dongle, you should add some pieces of wire to the ground of the antenna plug, so it looks like a simple groundplane, since they work worse, if there isn't a HT with some metal on their base. There are other antennas as well, but for me it seems, most manufacturers concentrate on building portable antennas for the lower bands. In the US, there are directional antennas build by Arrow Antenna or Elk, but these don't seem to be available in Germany. Wimo just added a SOTA antenna, maybe I'll give it a try. Another nice manufacturer is Lambdahalbe, they build antennas made of wire and are really portable. Just throw a rope on a tree and hang the antenna as high as you like it to be. Because of there construction, they work best if they are away from any conducting material, so the tree former mentioned is perfect. You'll need an USB extension, I always carry two different in my bag. One is about one meter, the other one is three meters long. If you buy one, be sure to check it at home, as some won't work properly, especially the ones longer than three meters. I've purchased my long USB cable from Amazon basics and even using both cable together works flawlessly. A padded sleeve saves your notebook from scratches and you can use it as a spacer so you don't have to lay your notebook on any muddy surfaces. Depending on the antenna your using, you should carry some material to mount it properly. Using the Lambdahalbe antenna, I'm carrying a few meters of a 2mm rope with me. The people at Nite Ize have many great tools, that are really handy using the RTLSDR portable. Using the Figure 9 Carabiner, you can easily secure the rope and connect it with the antenna. If you're using a HT antenna, you could use the Gear Ties from Nite Ize, to mount it properly. 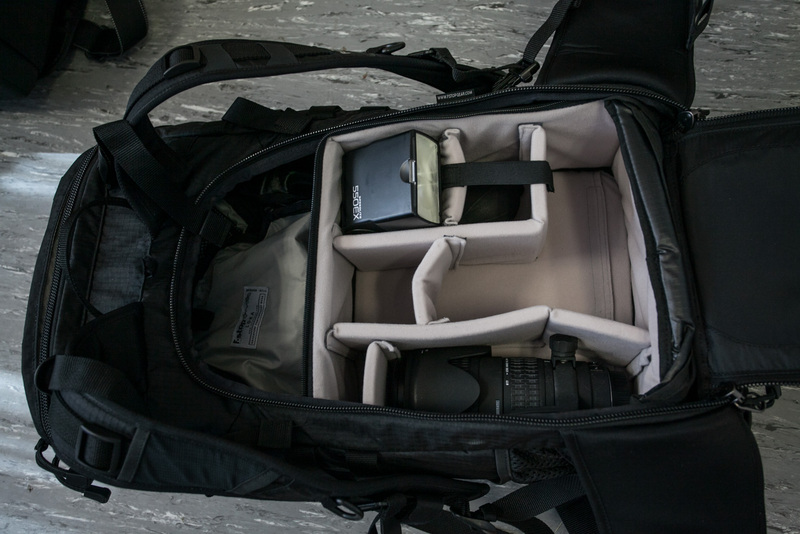 Of course, you need a proper bag to carry all your gear, but since the market is so big and I assume, most of you already own one, I'll jump over this topic. As you can see, there isn't really any special equipment needed for using your RTLSDR outdoors. Of course, you can extend this to the finest gear available, using rugged notebooks like ToughBooks, protect them using carrying gear from Peli and so on. But you don't need this to have some fun in the field! Nach meiner Einführung gestern, möchte ich das feine Teilchen dann auch mal ausführlicher vorstellen. Wie schon beschrieben, soll der F-Stop Loka als Allrounder dienen, dabei meine Fotoausrüstung sicher und komfortabel durch die Gegend transportieren und auch noch genug Platz für zusätzliche (Wander-)Ausrüstung bieten. Die Mountain Serie von F-Stop besteht immer aus einem Rucksack (Shell) und einem Inlay (ICU) für die Kameraausrüstung. Beides gibt es in verschiedenen Varianten und Größen und sollte so viele Einsatzbereiche abdecken können. Leider konnte ich bisher keine besseren Bilder von dem schicken Teil machen, aber ich denke man erkennt das Gröbste darauf. Ansonsten sind die Bilder auf der Homepage von F-Stop wirklich gut und aussagekräftig, wie ich finde. Auch die Bilder des Tests von MTB-News.de zeigen viele Details. 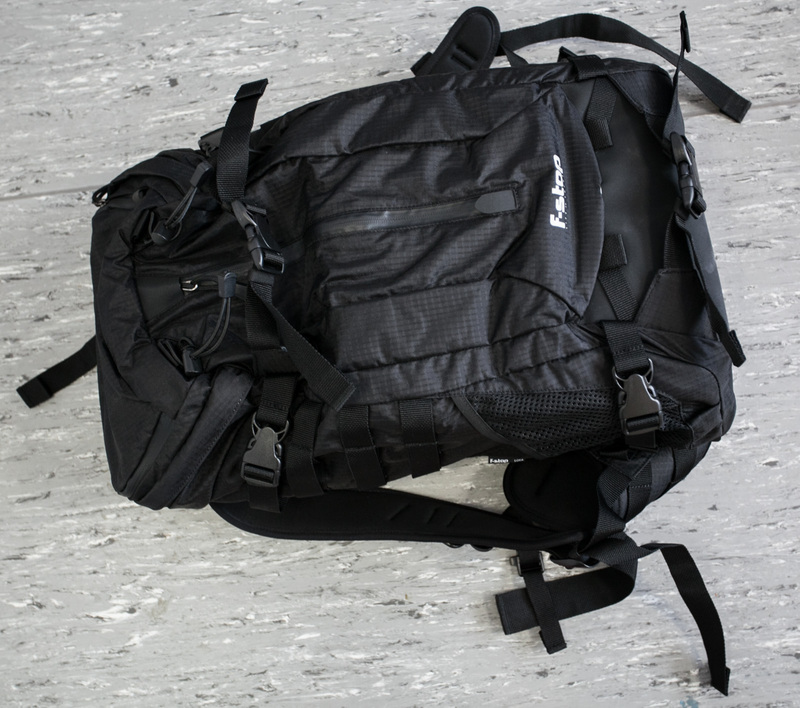 Der Loka ist ein Tourenrucksack mit angegebenen 37 Litern Volumen und 1,56 Kg Gewicht. Dazu kommt natürlich noch das Gewicht der ICU. Er besteht aus einem Hauptfach, welches über das Tragesystem und den Deckel zugänglich ist. Grundsätzlich kann der Loka ICU's in den Größen von Small bis Large aufnehmen. Large deckt dabei die gesamte Rückenöffnung ab, bei den anderen beiden bleibt ein entsprechend großer Spalt, der mir erst etwas merkwürdig aussah. In der Praxis ist das aber überhaupt kein Nachteil, ganz im Gegenteil. So kann man zum einen seinen Fotokram bequem unter bekommen und gleichzeitig noch das Fach darüber mit sonstiger Ausrüstung beladen. Auf der Rückseite des Tragesystems sind noch weitere Fächer, bspw. für Speicherkarten etc. vorgesehen. Die ICU wird mittels Klettstreifen an einem Alu-Gestänge befestigt und kann sich somit auch bei heftigerer Bewegung nicht im Rucksack selbstständig machen. Praktisch ist der helle Stoff im Inneren des Rucksacks, somit lassen sich Sachen doch einfacher finden als in einem schwarzen Loch, gerade bei kleiner ICU und entsprechend viel Platz für sonstiges Material. Der Loka besteht aus 330er Ripstop Nylon und ist am Boden mit Hypalon verstärkt, welches teilweise auch für Steigeisentaschen verwendet wird und dementsprechend robust ist. An den Seiten befinden sich Molle-Schlaufen, um hier noch weitere Taschen oder andere Ausrüstungsgegenstände befestigen zu können. Diese findet man übrigens auch am Hüftgurt. Ebenso finden sich Kompressionsriemen und Netztaschen an der Seite. Der Deckel des Hauptfachs ist mit einer weiteren Taschen versehen, welche nochmal zwei kleine Klettfächer beinhaltet. Oben auf dem Foto ist ebenfalls der Ausgang für das Trinksystem zu sehen, welches im Rucksack befestigt werden kann. Wem das zu heikel ist, der kann ein beliebiges Trinksystem natürlich auch in einer entsprechenden Hülle außen befestigen. Auf der Front befindet sich ein weiteres kleines Fach, welches mittels wasserdichtem Reißverschluss geöffnet werden kann. Außerdem findet man verschiedene Möglichkeiten zur Befestigung, bspw. eines Stativs und Schlaufen für die Gate Keeper. Ein Fach für eine Regenhülle findet sich auf dem Boden, jedoch muss man diese extra dazu bestellen. Andere Tests sagen, dass der Loka schon ohne diese gut gerüstet gegen Schauer ist, aber eine zusätzliche Hülle bringt natürlich noch mehr Sicherheit. Kommen wir zu einem der wichtigsten Punkte bei einem Rucksack, das Tragesystem. Es handelt sich hierbei und ein relativ hartes und gut anpassbares System. Wer einen perfekt belüfteten Rucksack mit offenporigem Schaum oder gar einem Netzrücken sucht, ist definitiv falsch. Am ehesten ist das System vergleichbar mit anderen Tourenrucksäcken für alpine Gegenden wie zum Beispiel dem Osprey Mutant. 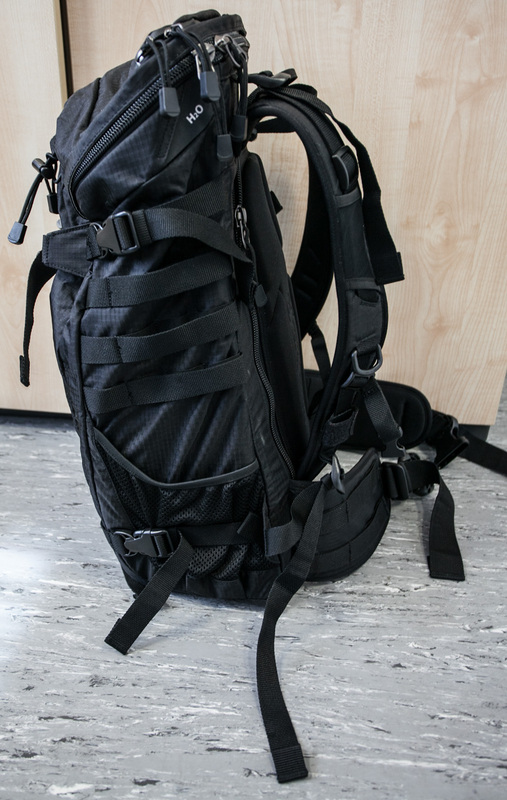 Ziel ist es, den Rucksack möglichst stabil am Rücken des Trägers zu halten und auch bei stärkeren Bewegungen nicht aus der Ruhe zu bringen. Dabei bleibt das Gewicht durch den engen Kontakt nahe beim ursprünglichen Schwerpunkt und der Rucksack zieht einen nicht nach hinten. Beim Loka geht also Kontrolle deutlich über Belüftung, das sollte man bei der Auswahl beachten. Wer mehr Belüftung haben will und weniger an Zeug mit sich rumträgt, der sollte sich mal den Guru ansehen. Ich sehe das bewusst nicht als Kritikpunkt, sondern es handelt sich einfach um einen Rucksack mit einem alpinen Tragegestell. Vom Tragekomfort kann ich überhaupt nicht meckern, auf meinen Rücken passt der Loka gut und mit meiner Ausrüstung kann ich das Tragesystem bisher nicht an seine Grenzen bringen. Die Hüftflossen sind eher stabil und damit auch in der Lage, Kraft auf die Hüfte abzuleiten. Wie schon beschrieben, befinden sich Molle-Schlaufen auch am Hüftgurt. Außerdem findet man verschiedene Möglichkeiten zur Befestigung bspw. der Kamera an den Schultergurten und auch Schlaufen für den Trinkschlauch sind vorhanden. Für meine Ausrüstung habe ich zunächst einmal zwei ICU geordert, Medium und Small pro. Die pro-ICUs sind so tief, dass eine Kamera mit Batteriegriff hinein passt. Wenn man darauf nicht angewiesen ist, kann man auf die Shallow-ICU zurückgreifen und gewinnt mehr Platz im Rucksack. Als Alternative dazwischen gibt es noch die Slope-ICU, welche angeschrägt sind und somit auf der einen Seite Platz für einen großen Body lassen, aber auf der anderen Seite nur so hoch sind wie die Shallow-ICU und dementsprechend ein Kompromiss zwischen Platz für die Fotoausrüstung sonstigen Gegenständen darstellt. Die kombinierbaren Größen finden sich bei F-Stop in der Beschreibung des Loka. Bei den ICUs findet man dann auch Beschreibungen und Bilder, was alles in die jeweiligen Größen reinpasst. Teilweise stimmen leider die Beschreibungen nicht mit den Bildern überein, was sicherlich bald behoben wird. Eine ICU besteht aus dem von anderen Fototaschen bekannten Schaumstoffeinsätzen, die über Klett miteinander verbunden werden können. Weiter findet man noch elastische Bänder mit Klett, um die Ausrüstung vor dem Herausfallen zu sichern. Jede ICU wird in einem Stoffbeutel geliefert und ist mittels Reißverschluss verschließbar. Im Deckel findet sich ein Schaumstoffpolster, um die Ausrüstung in ausgebautem Zustand zu schützen. Dieses kann entnommen werden, um den Deckel weg zu klappen und dann im Rucksack zu befestigen. Außerdem findet man noch einen Tragegriff an der ICU und D-Ringe, um einen Tragegurt daran zu befestigen und sie damit einzeln Transportieren zu können. Die Kamera befindet sich derzeit am unteren Boden der Medium ICU, um den Schwerpunkt weit unten zu behalten. In diesem Fall muss aber auch das Tragesystem komplett geöffnet werden, um die Kamera zu entnehmen. Hier kann man also noch einiges optimieren. Gut zu sehen ist die Möglichkeit, auf den Inhalt des Rucksacks außerhalb der ICU zugreifen zu können. F-Stop vertreibt seine Produkte in erste Linie direkt, wobei man einen Vertrieb in Europa nutzen kann und somit keine Einfuhrumsatzsteuer etc. entrichten muss. Dennoch ist das der einzige wirkliche Nachteil, den ich sehe. Man kann die Sachen eben nirgends im Laden begrabbeln und sich ein Bild davon machen. Außerdem ergeben sich teilweise echt heftige Lieferzeiten, wie man auf der Homepage ja sehen kann. Teilweise kann man sein Glück auch noch bei www.cameranu.nl versuchen. Dort habe ich den Loka mit den 2 ICU bestellt und die Lieferung über UPS ging wirklich schnell. Aber auch dort ist vieles nicht lieferbar. Ich werde mir auf jeden Fall noch eine Large-ICU bestellen, wobei ich mich noch zwischen der Slope und der Pro entscheiden müsste. Nachdem es mich lange beschäftigt hat, will ich mal kurz beschreiben, wie ich meine Fotoausrüstung neuerdings transportiere. Im Anschluss gibt es dann auch noch eine ausführlichere Vorstellung der Gerätschaften. 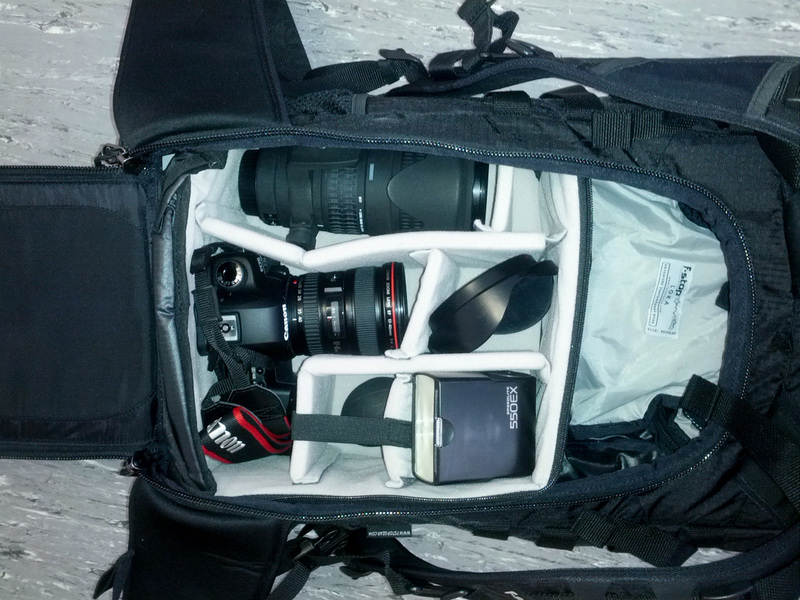 Zum ist-Stand, ich hatte lange Zeit einen Lowepro Minitrekker AW, also einen Fotorucksack, dem man sein Alter durchaus ansieht. Gar nicht mal wegen irgendwelchem Verschleiß, sondern mehr, weil sich mit den Jahren doch einiges getan hat. Das Tragesystem ist eigentlich keins, schlechte Belüftung und Komfort ist im Vergleich zu Tourenrucksäcken ein Fremdwort. Gegen den Schutz der Ausrüstung kann man dagegen nicht viel sagen, auch die Übersicht ist gut. Insgesamt will ich ihn hier nicht zu schlecht stehen lassen, aber nach einigen Jahren durfte auch mal etwas neues her. Und damit fing das Drama an. Es gibt mittlerweile eine große Anzahl verschiedener Konzepte. Grundsätzlich gibt es natürlich Schultertaschen und Rucksäcke, und dann eben noch sogenannte Slingbags, die in der Regel über eine Schulter gehen und durch Ziehen des Rucksacks vom Rücken auf die Brust den Zugriff auf die Ausrüstung ermöglichen. Noch vor dem Lowepro hatte ich mal eine Crumpler Next Venue, mit der ich ebenfalls zufrieden war. Toll bei Schultertaschen ist natürlich immer der einfache Zugriff und auch der Wechsel von Objektiven ohne etwas ablegen zu müssen und ohne größere Absturzgefahren für die Ausrüstung. Weniger toll ist dafür der Transport von schwerer Ausrüstung über längere Strecken. Hier sind Rucksäcke natürlich klar im Vorteil, von der Kompaktkamera und bisschen Wanderausrüstung bis zum Transport des Materials für ganze Fotoexpeditionen ist alles drin. Dazwischen kann man die Slingbags einsortieren, die sich etwas komfortabler als Schultertaschen tragen lassen, aber dennoch den einfachen Zugriff auf die Ausrüstung ermöglichen. 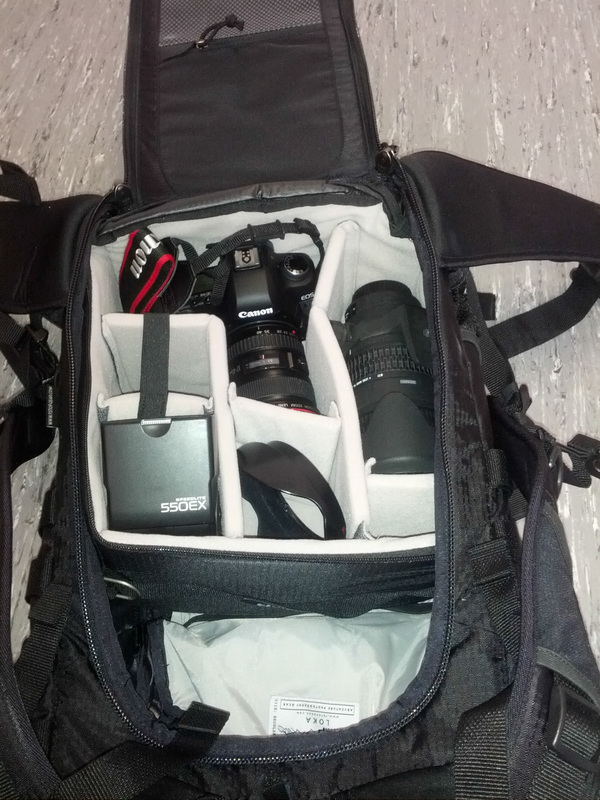 Einen etwas erleichterten Zugriff auf das Material bieten noch Rucksäcke mit einer Öffnung im Bereich des Tragesystems, wie zum Beispiel die Lowepro Flipside-Reihe. 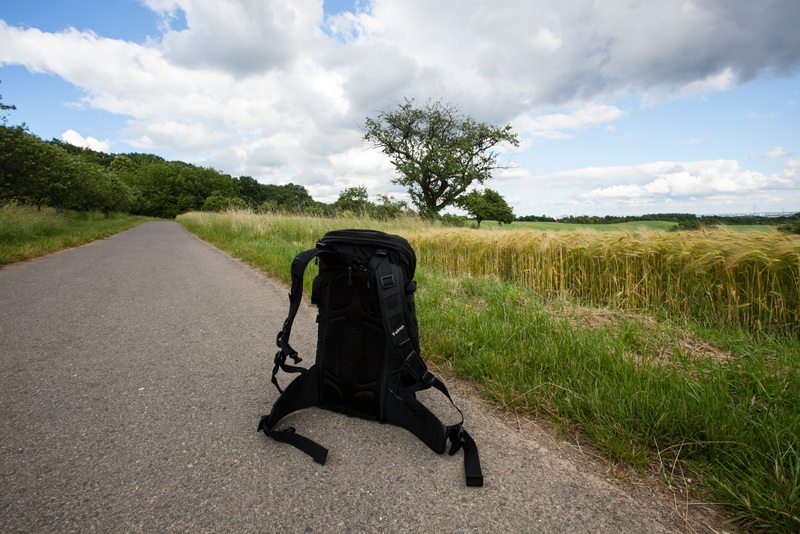 Man kann den Rucksack bei geschlossenem Hüftgurt vom Rücken nach vorne drehen und dann nach vorne klappen lassen, um Zugriff auf den Inhalt des Rucksacks zu bekommen. Klingt kompliziert, ist aber ne schöne Sache und aus meiner Sicht bieten die Modelle ein sehr schönes Preis-Leistungsverhältnis! Also hier schon mal der erste Tipp, wenn man einen "klassischen" Fotorucksack sucht. Mittlerweile gibt es eine beachtliche Sammlung und es gibt nicht viele Modelle, die dort nicht vertreten sind. Gleichzeitig kann man das Projekt natürlich mit zusätzlichen Bildern unterstützen und so anderen Fotografen helfen. Soviel erstmal zum Vorgeplänkel. Für mich wichtig war natürlich, meine Ausrüstung verstaut zu bekommen. Dazu gehören derzeit eine Canon 5DII, ein Canon 17-40, Sigma 70-200 2.8, Canon 550EX und noch bissi Kleinkram wie Filter, Akkus, Speicherkarten etc. Außerdem sollte noch zusätzliche Ausrüstung wie eine Regenjacke, Nalgene-Trinkflasche und ähnliches reinpassen. Dazu ein ordentliches Tragesystem und die Möglichkeit, mein leider nicht besonders kleines und leichtes Stativ transportiert zu bekommen. Vorzugsweise sollte das Modell der Begierde auch einen zusätzlichen Rucksack bei Tagestouren im Mittelgebirge und den Alpen ersetzen können. Außerdem bin ich ja im Moment viel unterwegs und muss somit auch mal den Kram in Städten rumtragen und somit die urbane Survivalausrüstung (Google Nexus 7, Regenschirm, Einkaufstasche ;-) ) transportiert bekommen, möglichst kompakt und mit leichtem Zugriff. Hier merkt man schon, dass die Anforderungen so weit auseinander gehen, dass es mit einem einzigen Rucksack oder einer Tasche nicht getan ist. 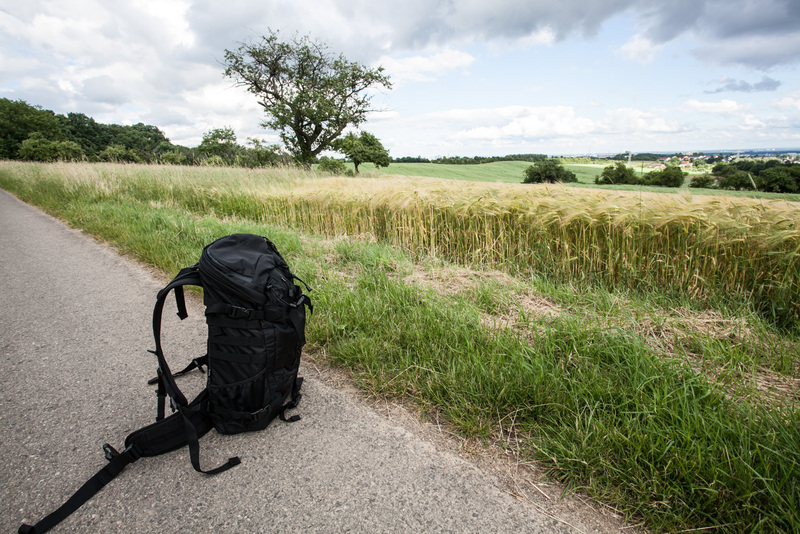 Ab hier standen dann auch ein Rucksack und eine Schultertasche auf der Einkaufsliste. Grundsätzliche Anforderungen habe ich ja oben schon beschrieben. Es gibt mittlerweile durchaus Kombinationen der üblichen Hersteller, die einen Bereich für die Fotoausrüstung in Beschlag nehmen und Platz für weitere Ausrüstung bieten. Hier wäre sowas wie der Lowepro Photo Hatchback zu nennen. Aber dort passt auch in das größte Modell meine Ausrüstung nicht rein. Längere Zeit habe ich bei diversen Händlern und auch bei Globetrotter verbracht und dort verschiedenste Kombinationen durchgespielt. Meine Ausrüstung passt rein und der Schutz erscheint beim Begrabbeln im Geschäft durchaus ausreichend. Allerdings benötigt man einen Rucksack, dessen Front sich möglichst weit öffnen lässt und selbst dann ist der gepolsterte Deckel des Inlets noch etwas im Weg, lässt sich aber einigermaßen wegbiegen. Alle dedizierten Fotorucksäcke waren zu diesem Zeitpunkt bereits rausgeflogen, teilweise wegen fehlendem Platz, schlechtem Tragesystem, mangelnder Flexibilität etc. Auch bei den Tourenrucksäcken bleiben nicht viele Alternativen. Für mich sind am Ende nur zwei Modelle übrig geblieben: Der Tasmanian Tiger Mission Pack und der 5.11 Rush 24. Beides nicht gerade zivile Modelle, aber dank den Molle-Schlaufen sehr variabel und in Schwarz wäre es einigermaßen erträglich gewesen. Für den TT Mission Pack sprach klar das komfortable Tragesystem, dafür war das Inlay nur mit einiger Überredungskunst in den Rucksack zu bekommen. Hier macht sicher auch Übung den Meister und im Endeffekt baut man das auch nicht ständig rein und raus und somit hätte man damit leben können. Im Gegensatz zum 5.11 gehen die Reißverschlüsse nicht bis fast an den Boden, sondern hören einige cm weiter oben auf, was den Zugriff erschwert. Beim Rush 24 dagegen ließ sich das Inlet ohne viel Aufwand verstauen und der Rucksack ließ sich gut schließen. Dafür ist das Tragesystem deutlich simpler und der zusätzliche Platz im Rucksack hält sich sehr in Grenzen. Der TT Mission Pack ist bei Amazon ungefähr zum Preis des 5.11 zu haben, hier also kein großer Unterschied zwischen den Modellen. So bekommt man für deutlich unter 200 Euro eine interessante Kombination mit dem Mountainsmith-Inlay. Berichte, bspw. im DSLR-Forum und bei MTB-News waren mehr als positiv und damit war ich endgültig angefixt. Tatsächlich haben die Teile von F-Stop nur einen wirklichen Nachteil, die Lieferzeit kann lange dauern. Aber ich hatte Glück und somit traf kurze Zeit darauf der F-Stop Loka mit der Pro-ICU in Medium und Small ein. Ein sehr schönes Modell, welches ich aber in einem anderen Beitrag nochmal ausführlicher vorstellen will. Hier waren die Anforderungen ja eher gering, zumal ich nicht unbedingt das Stativ an einer Schulter hängen haben möchte. Also war es mehr eine subjektive Entscheidung. Bei vielen Fotografen sehr beliebt sind die Taschen und Rucksäcke von Think Tank Photo. Nette Features, sicher nicht ganz billig, aber durchaus preiswert. Beliebt und bewährt ist die Urban Disguise-Modellreihe, wobei mich das 40er Modell am ehesten angelacht hat. In Anbetracht der Anschaffung des Rucksacks war mir der Preis allerdings dann doch etwas hoch. Noch nicht allzu lange gibt es die Sub Urban Disguise-Reihe, die mit etwas kleineren Taschen und etwas reduzierten Features aufwartet, bei deutlich günstigeren Preisen. Das größte Modell der Reihe erschien mir ausreichend das ist es dann auch geworden. Auch dieses werde ich demnächst hier mal vorstellen. Jetzt ist der Text doch recht lange geworden. Daran kann man aber eben auch sehen, dass ich mir wirklich nicht leicht getan habe mit der Auswahl. Die ersten Touren mit der neuen Ausrüstung sind gemacht und ich bin bisher echt zufrieden. 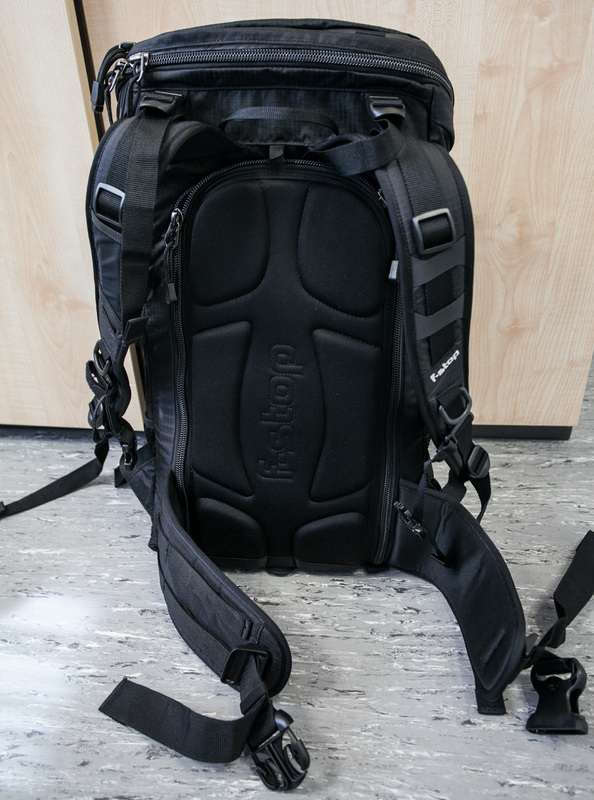 Aber insgesamt ist die Auswahl der passenden Fototasche/-rucksack eine sehr individuelle Sache. Vielleicht habe ich mit diesem Roman doch noch den einen oder anderen Hinweis geben können. So, wenn ich schon dabei bin, gibt es gerade noch einen Post hinterher. Wer wie ich bisher etwas Probleme hatte, den DSD auch zu einer Audioausgabe zu bewegen, dem kann geholfen werden. Möglicherweise ist das auch völlig trivial, aber ich bin nur zufällig auf den entscheidenden Hinweis gestoßen, weswegen ich es hier doch nochmal beschreiben will. Zum DSD habe ich ja bereits etwas geschrieben, ebenso zu SDR#. Um das ganze System zum Laufen zu bringen, muss man wie bisher auch immer VAC oder ein ähnliches Programm nutzen. In SDR# dann den passenden Audioausgang wählen und VAC das Signal auf einen weiteren Line-Ausgang "patchen" lassen. Jetzt stimmt man SDR# auf die entsprechende Frequenz ab, auf der ein P25 oder DMR-Signal empfangen wird, und natürlich startet man wie bekannt den DSD in der Kommandozeile. Es müssten jetzt Meldungen über entsprechend dekodierte Pakete über den Bildschirm fliegen, und DSD sollte zumindest schon einmal sagen können, ob es sich um dekodierbares Digitalsignal handelt. Bei kamen zu diesem Zeitpunkt auch immer mal kürzere Sprachfetzen über den Lautsprecher, aber nie mehr als einzelne Silben. Entscheidend ist jetzt die Einstellung in SDR#, den Audiofilter auszuschalten und den Haken bei "Swap I&Q" zu setzen. Daraufhin muss man neu abstimmen, das Frequenzspektrum wird an der Mittenfrequenz gespiegelt und man muss das Signal erstmal wieder suchen. Hat man es gefunden und sauber darauf abgestimmt, sollte man dem Gespräch lauschen können. Die Sprachqualität ist dabei eher schlecht, was wohl an der Implementierung der entsprechenden CODECs liegt, aber für erste Experimente sollte es reichen. Ich hätte auch gerne mal ein Sample hier hochgeladen, aber ich möchte ungern Aufzeichnungen von anderen Leuten ohne deren Wissen hier reinsetzen. 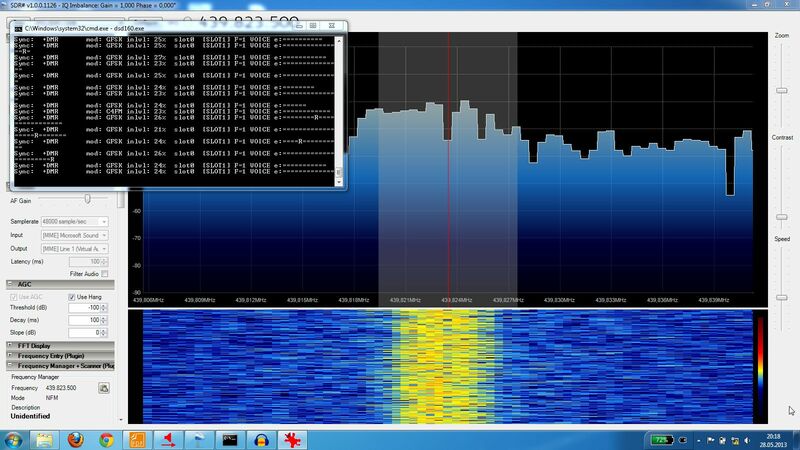 SDR# (sprich SDR Sharp) ist ein SDR-Programm, welches ebenfalls kostenlos zu bekommen ist und kontinuierlich weiter entwickelt wird. Schon früh kam die Integration des RTL-SDR mit ins Paket, jedoch war mir die Oberfläche damals zu spartanisch und die Möglichkeiten doch eher begrenzt. Das hat sich mittlerweile geändert, auch wenn mir persönlich die Oberfläche von SDR-Radio.com besser gefällt. Aber zum Vergleich später mehr. Dabei wird die aktuellste Version geladen, genauer die Dev-Version, in die die aktuellsten Änderungen integriert sind, die aber auch nicht immer 100%ig stabil sein muss. Bisher hatte ich damit allerdings keine wirklichen Probleme. Am besten startet man das Skript direkt in einem extra angelegten Ordner, denn dort wird auch das Verzeichnis für SDR# angelegt. Eine Installation erfolgt nicht, das Programm kann direkt im Unterordner gestartet werden. Nur soviel, über das Dropdown-Menü links oben lässt sich das jeweilige SDR auswählen, wo wir natürlich RTL-SDR/USB auswählen. Wenn der Stick richtig erkannt wurde, geht es nach dem Klick auf die Schaltfläche "Play" auch los und unser Dongle sollte sich über die Spektrumanzeige oder die Frequenzanzeige oberhalb davon abstimmen lassen. In "Configure" gibt es verschiedene Optionen für unser SDR, unter anderem die Aktivierung der AGC oder ggf. eine manuelle Verstärkungssteuerung. Die oberen Einstellungen sind ausgegraut, wenn man zuvor auf "Play" gedrückt hat, weil sich diese im laufenden Betrieb nicht ändern lassen, eigentlich logisch. Links oben unter Radio lassen sich Parameter wie Bandbreite, Modulationsart etc. einstellen. Nett ist auch die Funktion, eine Schrittweite festzulegen und SDR# zu sagen, dass es sich am Raster orientieren soll. Bei kalibriertem Dongle lässt sich so direkt zwischen den einzelnen Kanälen springen und auf der anderen Seite immer noch eine Feinabstimmung über die Frequenzanzeige oben durchführen. Die meisten Einstellungen links sind selbsterklärend und lassen sich mit etwas Spieltrieb selbst erkunden. Was sind jetzt die Vorteile aus meiner Sicht gegenüber anderen Programmen? SDR# ist für mich sehr übersichtlich gestaltet. Es gibt fast keine verschachtelten Menüs, das Spektrum ist immer im Blick. So lässt sich gut mit den Einstellungen experimentieren und die Ergebnisse sind sofort sichtbar, insbesondere bei der Verwendung von Dekodern etc., wo man also nicht direkt das empfangene Signal hört und somit die direkte Rückmeldung über den Erfolg oder Misserfolg von Einstellungen erfahrbar ist. Das Spektrum nimmt auch gleich den größten Raum des Bildschirms ein, welches die Ausrichtung auf die empfangenen Signale gut sichtbar macht. Was die Auswahl von Modulationsarten betrifft, geben sich die üblichen Programme nicht wirklich was. Wie man am obigen Screenshot sieht, kann SDR# auch RDS bei Rundfunksendern dekodieren, eine ganz praktische Funktion, welche aber ein ordentliches SNR erfordert. Ein ganz wichtiger Punkt aus meiner Sicht ist die Möglichkeit, Plugins zu installieren. Damit wird die etwas spartanische Frequenzverwaltung gut ausgeglichen, wobei der Markt erfreulicherweise kontinuierlich wächst. Schade ist, dass man zum Ändern von manchen Audioparametern die aktuellen Wiedergabe unterbrechen muss, bspw. um den Audioausgang zu ändern, das funktioniert bei SDR-Radio.com deutlich simpler. Dafür funktioniert die Rauschsperre recht gut, eine Wohltat für den FM-Hörer, wobei die Einstellung von HDSDR nach wie vor für mich am einfachsten ist. So, entgegen meiner Ankündigung gibt es wohl doch keinen Vergleich zwischen r820t und dem E4000. In meinem neuen Stick scheint nämlich tatsächlich noch ein E4000 zu stecken, behauptet zumindest SDR# und diverse andere Software. Geöffnet habe ich ihn bisher noch nicht, steht wohl die Tage noch an, wobei ich ihn lieber derzeit intakt lassen würde. 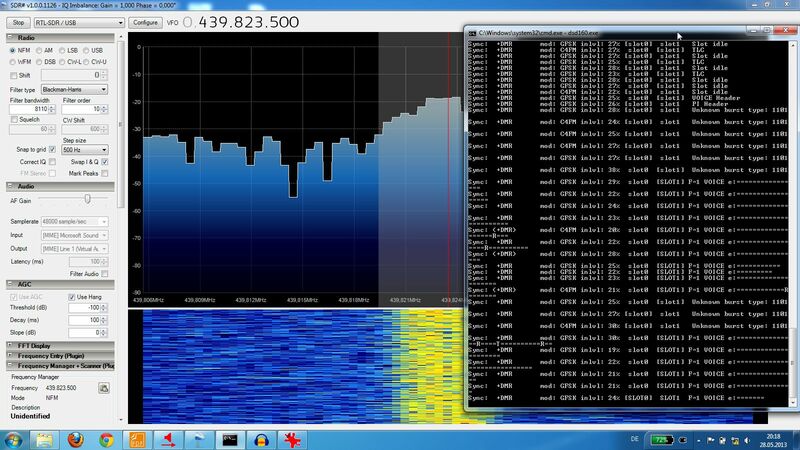 Merkwürdigerweise lässt SDR-Radio.com V2 jedoch auf unter 30 MHz abstimmen, da muss ich jetzt erstmal ausprobieren, ob das mit dem Terratec auch geht, in diesem steckt nämlich tatsächlich ein E4000. Signale konnte ich dort außer vielen Störungen leider bisher nicht ausmachen, was aber durchaus an den vorhandenen Antennen etc. liegen dürfte, also keine 100%ige Gewissheit in dieser Richtung. Dort findet sich auch das Datenblatt für den Tuner, für diejenigen, die es ganz genau wissen wollen. Allgemein eine sehr schön und ausführlich gemachte Seite, wenn auch etwas unübersichtlich. Was bringt der neue Tuner jetzt? Einerseits diskutiert man, ob dieser empfindlicher ist als der E4000, wobei die Tendenzen dazu gehen, dass er besonders in den hohen Frequenzbereichen besser ist als sein Vorgänger. Ich habe noch keine größeren Vergleichstests gestartet, werde das aber auf jeden Fall noch machen. Erste Tests sind sehr vielversprechend, vielleicht war der Cinergy-Stick aber auch einfach sehr taub für seine Spezies. Schön ist auch, dass der r820t bis auf ungefähr 24 MHz runter kommt, wer also mal in den CB-Funk-Bereich oder das 10m-Band reinhören will, kann hier auch ohne Konverter oder Mods glücklich werden. Zuhause kam ich damit nicht weit, aufgrund von ziemlichem QRM und der 50-cm-Magnetfußantenne auf dem Balkon, welche sicherlich nicht ideal ist. Aber demnächst kommt mal der Draht von RF Systems an die Buchse. À propos Buchse, an dem neuen Tuner ist eine MCX-Buchse verbaut, ein kurzes Adapterkabel auf IEC, ab da kann man den alten Adapter von IEC auf BNC weiter benutzen. Ist aber ein ziemlicher Verhau und sollte dann demnächst mal durch eine saubere Lösung abgelöst werden. Die Einrichtung funktioniert problemlos, einfach den Stick an USB klemmen, Windows 7 findet den passenden Treiber. Diesen dann wie beim E4000-Stick durch Zadig ersetzen lassen und im SDR-Programm entsprechend auswählen und es kann los gehen. Demnächst gibt es dann mal einen genaueren Vergleich, was die Teile so können, bin selbst gespannt.